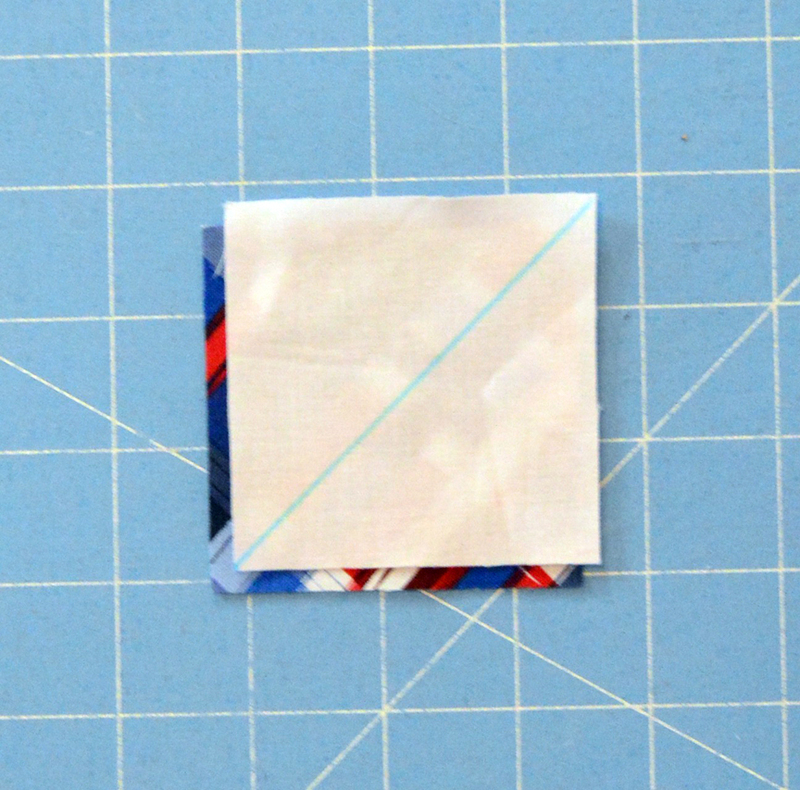 Step 1: Draw a diagonal line on the wrong side of a 2-3/4" white square. Layer right sides together with a 2-3/4" plaid square. Step 2: Stitch 1/4" on either side of the drawn line. Cut on the line. 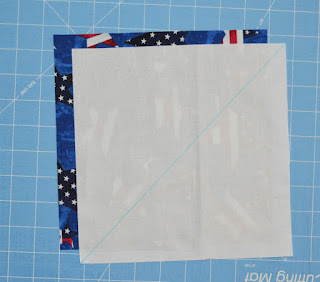 Step 3: Press both units open and trim to 2-3/8" square. Repeat to make a total of (8) HST units. 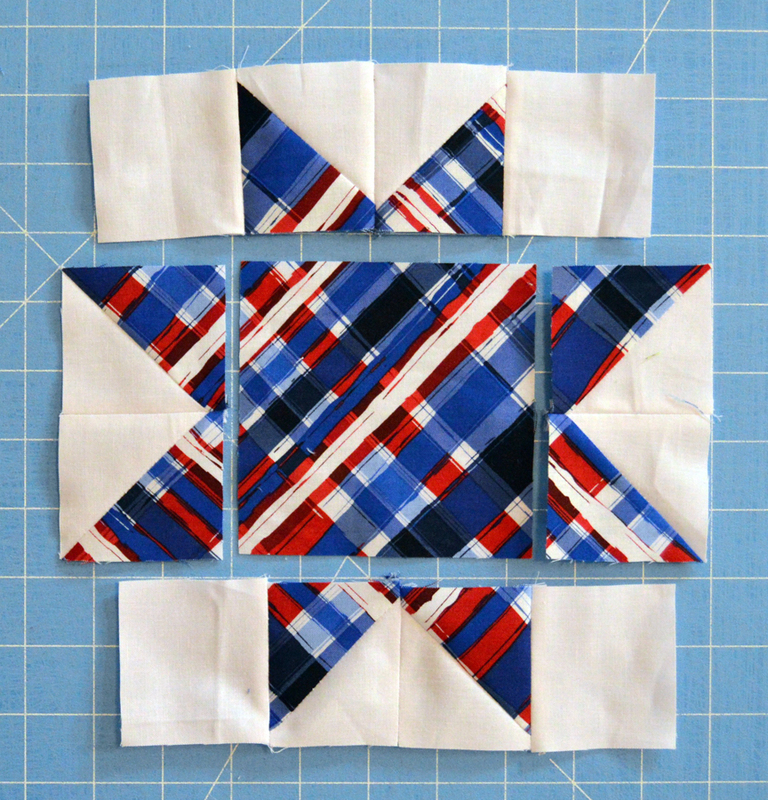 Step 4: Lay out the (8) HST units, (1) 4-1/4" plaid square, and (4) 2-3/8" white squares as shown. Step 5: Sew the HST units into pairs as shown. Sew white squares to both ends of two units. Step 6: Sew HST pairs to the sides of the center square. Sew the remaining units to the top and bottom to make the center star unit. 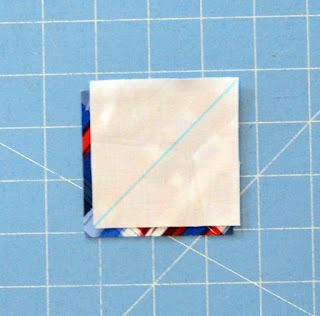 Step 7: Draw a diagonal line on the wrong side of a 4-3/4" white square. 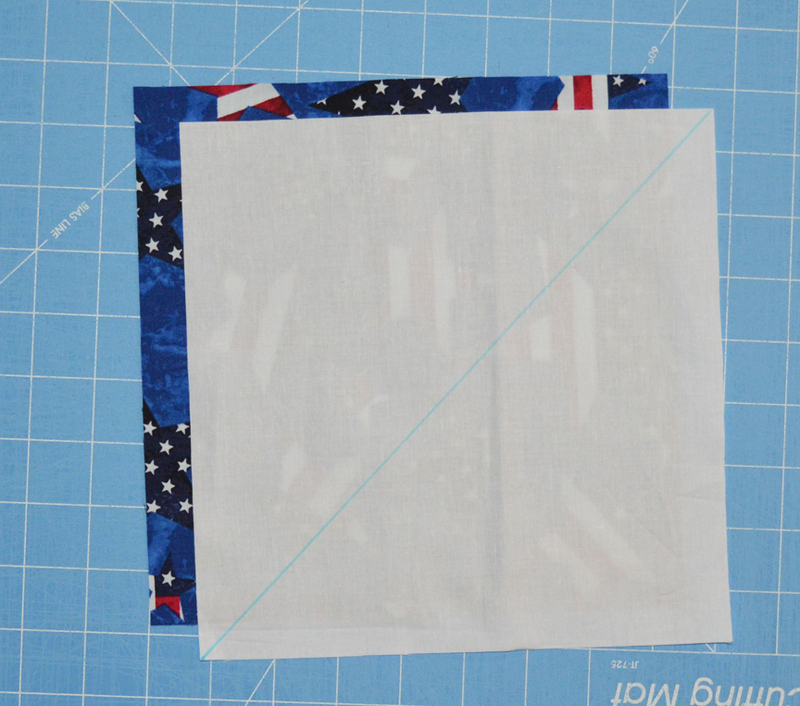 Layer right sides together with a 4-3/4" plaid square. Step 8: Sew 1/4" on either side of the drawn line. Cut on the drawn line and press both units open. Trim to measure 4-1/4" square. Repeat to make a total of (8) HST units. Step 9: Lay out the (8) HST units, (4) 4-1/4" white squares and center star unit as shown. 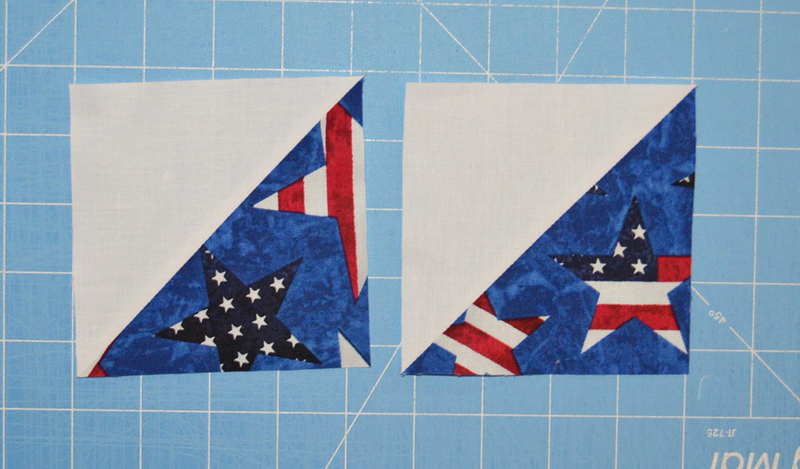 Step 10: Sew the HST units into pairs, and add 4-1/4"blue star squares to both ends of (2) units. Sew HST pairs to the sides of the center square. 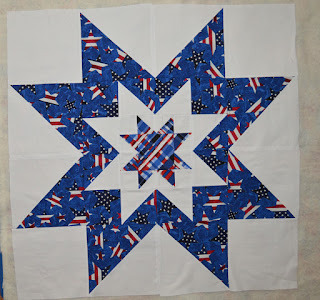 Sew the remaining units to the top and bottom to make the center star unit. 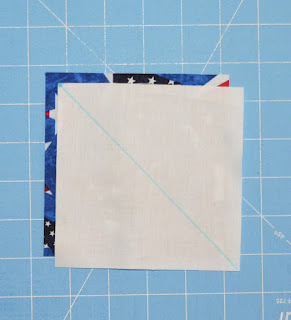 Step 11: Draw a diagonal line on the wrong side of (1) 8-1/2" white square. 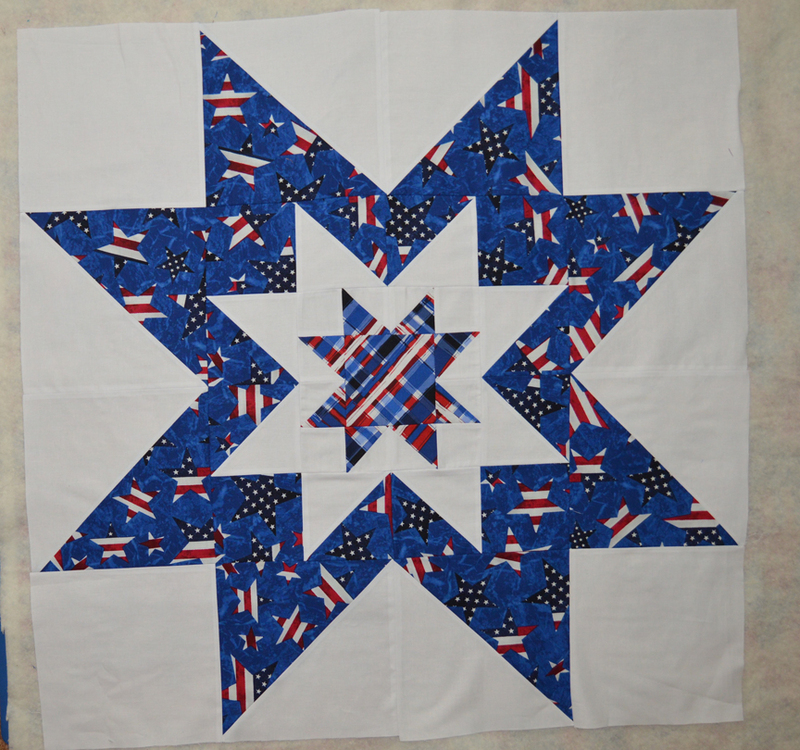 Layer right sides together with an 8-1/2" blue star square. Step 9: Sew 1/4" on either side of the drawn line. Cut on the drawn line and press both units open. Trim to measure 8" square. Repeat to make a total of (8) HST units. 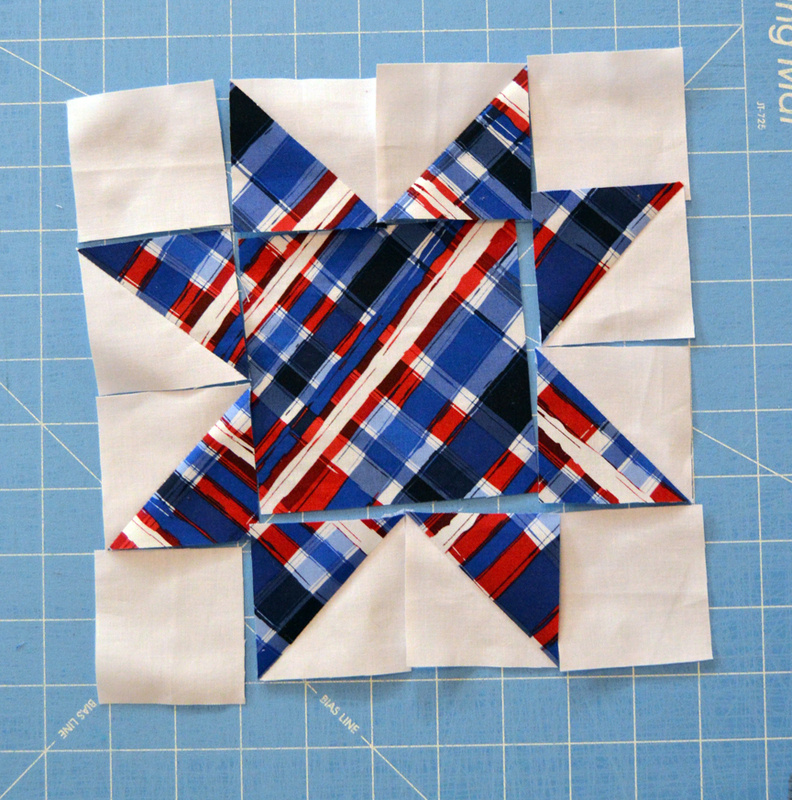 Step 10: Lay out the (8) HST units, (4) 8" white squares and center star unit as shown. 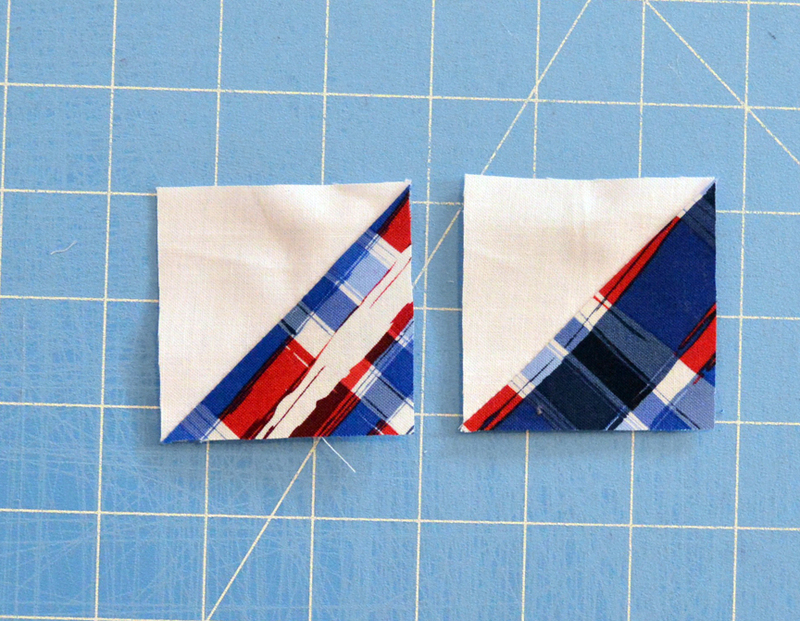 Step 11: Sew the HST units into pairs, and add 8" white squares to both ends of (2) units. 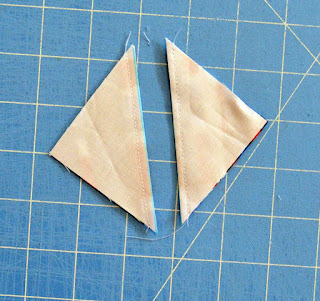 Sew HST pairs to the sides of the center square. 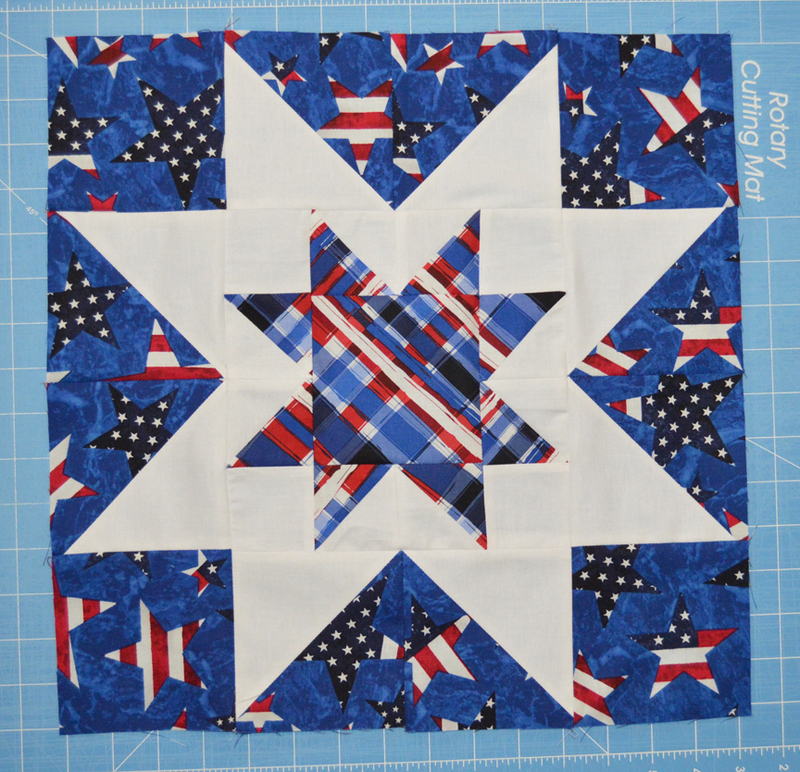 Sew the remaining units to the top and bottom to complete the quilt top. Step 12: Layer the backing right side down, batting and quilt top right side up. Quilt as desired. 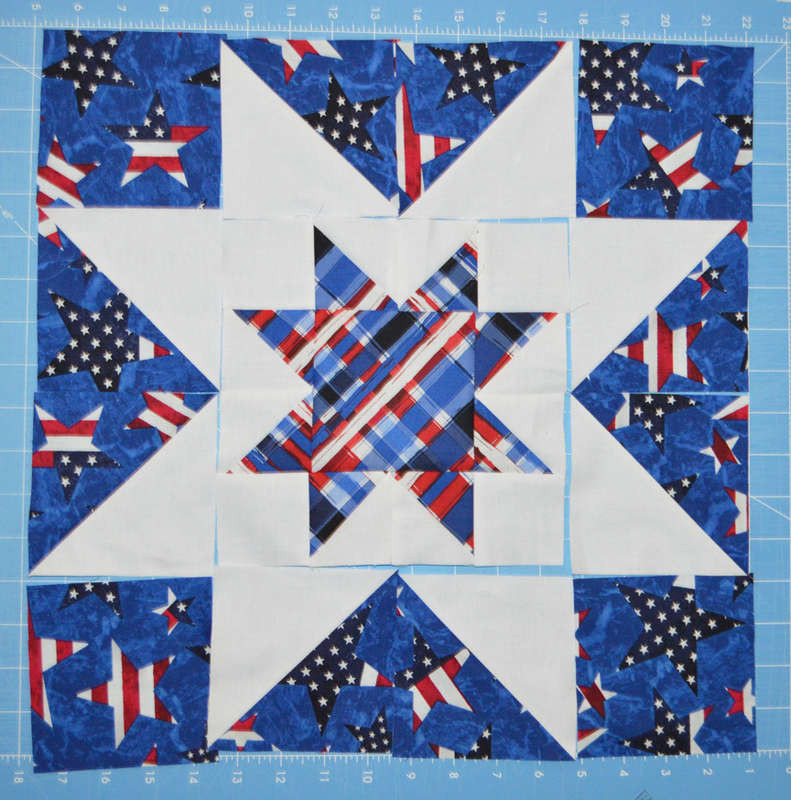 Trim batting and backing even with the quilt top. 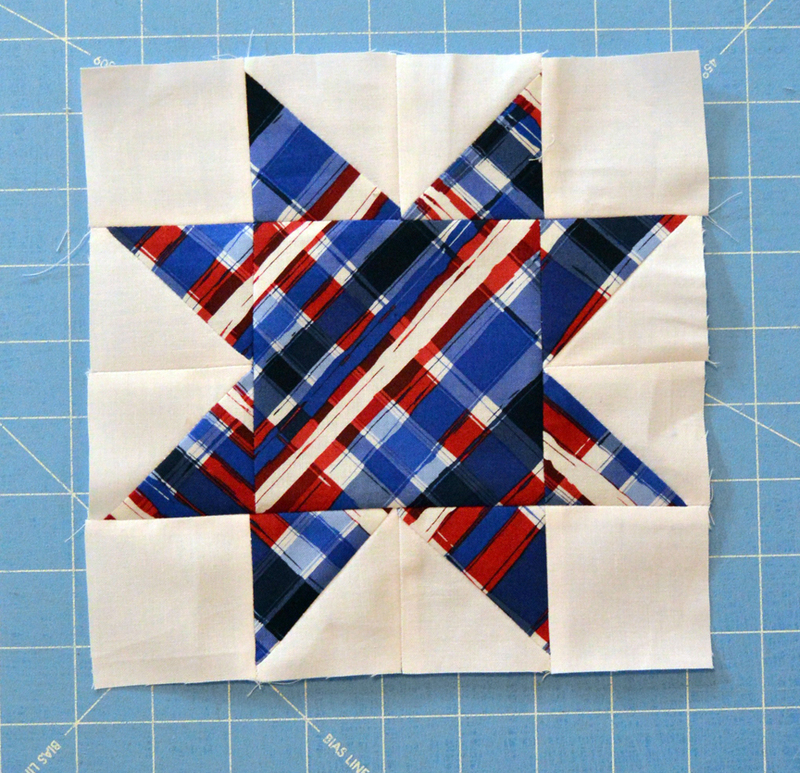 Use the (4) 2-1/4" x 42" plaid strips to bind the quilt. 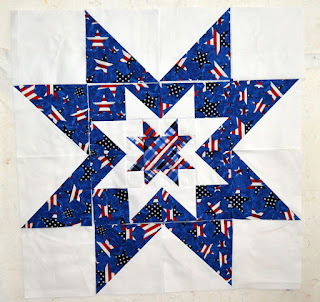 Would you like to win the fabrics used to make this quilt? Leave a comment below (or on IG) telling us your favorite July 4th tradition. Giveaway is open through Sunday, June 18th at 11:59 PM CDT. 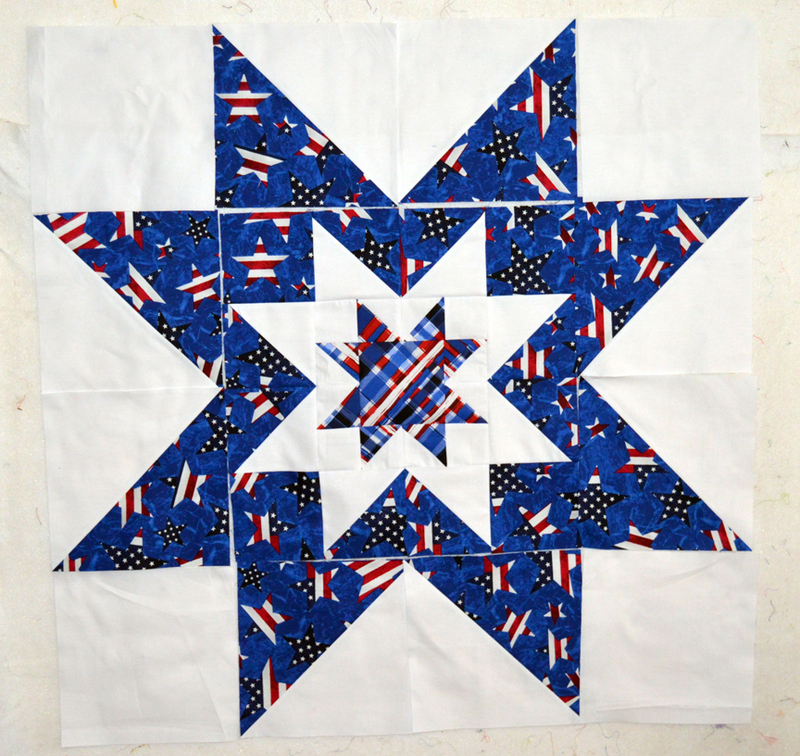 Find the entire American Pride collection here and ask for it at your local quilt shop. 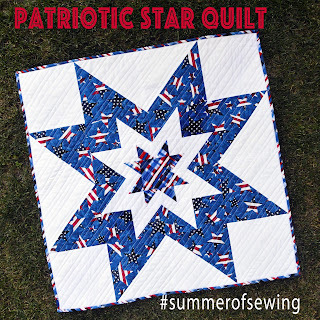 Visit our Feeling Patriotic Pinterest board here for more red, white and blue ideas. Congratulations to SliceofPiQuilts! We'll be contacting you for your mailing address. July 4th always means a big family picnic. Good food and good times! 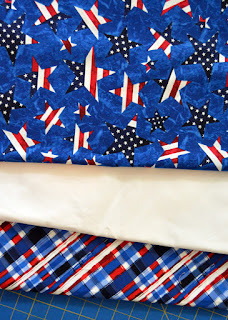 I have NO patriotic fabrics, so this bundle would be perfect for me to join in with this sew along. 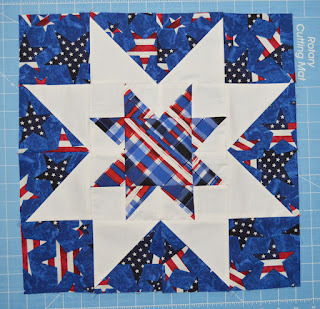 Great patriotic star block....I love it! I love this pattern and its fabrics. Your quilt is beautiful! I'm usually alone on July 4, and for years, it has been my practice to make a patriotic table topper or wall hanging on July 4. (Sorry about the deletion above; I hit Publish too soon!) ---"Love"
Getting together with family to enjoy the fireworks is our tradition for the 4th of July. Love this star topper. Our local parade and then a Dutch oven dinner at my house. My kids all come together for this, and we have fun. We run a race every Fourth of July and light fireworks. We also have a cook off. We choose one random ingredient and everyone makes something with it. Love this pattern! I made a similar one in just blue and white and called it Starry Night! I love this quilt. 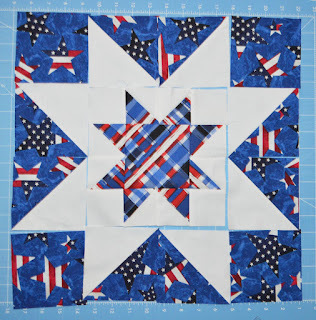 My daughter just asked me to make her a patriotic wall hanging and I think this one will work beautifully. Our favorite 4th of July tradition is going to the concert and fireworks in our town. My husband and daughter play in the band so it is even more fun for us. Picnic at the park and go out to the bay to watch the fireworks. No matter where in the world I live, I always display my American flag on the Fourth of July. I think I will make up this block for an indoor decoration as well. Thank you for the tutorial. 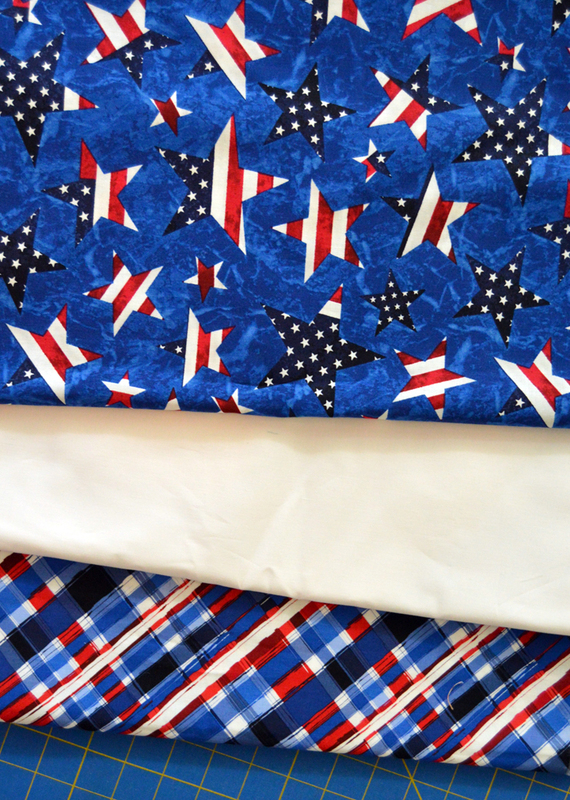 I'm very partial to patriotic fabrics. Born in July and consider myself a fire cracker! I really like the multiple stars in this small wallhanging. 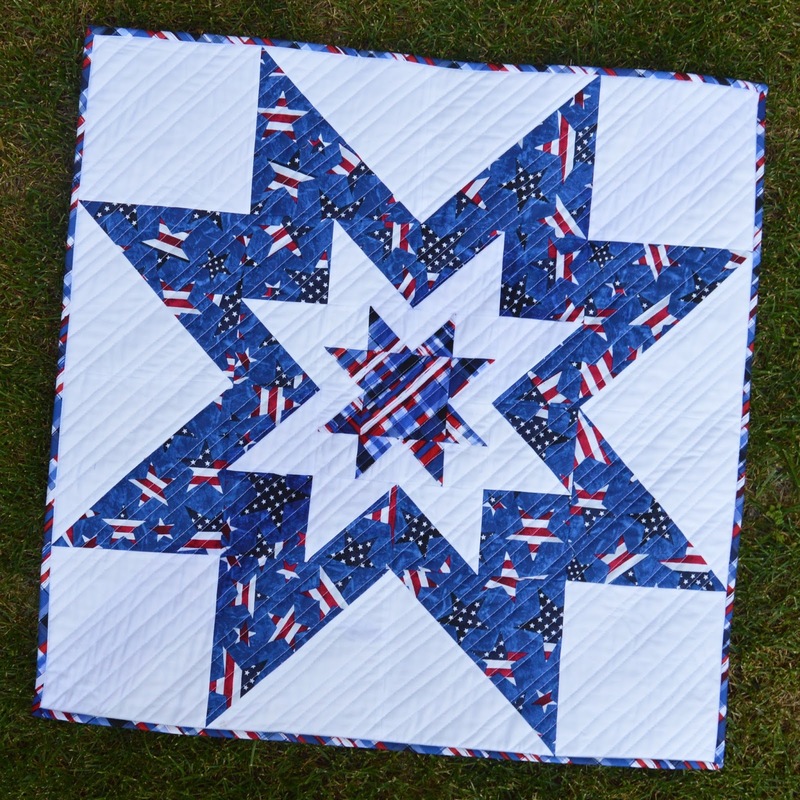 I love this quilt!! Wish I weren't in the middle of so much right now and I'd make it immediately. Soon though. Thank you for the tutorial. On the 4th of July when I was young we'd always watch the fireworks late at night on the 3rd. Where we live now fireworks start about a week before with nightly displays and I love watching them from our front yard. Fireworks are the 4th for us. Really cute! Wonder how it would look with another row or two? My favorite part of the day is the evening fireworks. July 4th to me means family comes and I am spoiled. (It is also my birthday) I have never regretted having my day on the forth I am also okay sharing it with our country. We usually go to our friend's house... Our families gather & few other friend's come by too.. for a cookout...and we watch the Hot Air Balloons from their front porch & yard! Then the Fireworks when dark!! :) So much fun!!! Thank you for chance to win your Give-a-way too!! 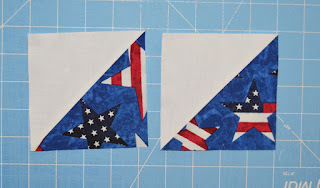 Your Quilt is Perfect for these fabrics..Looooove it!! A late day cookout and fireworks at the park. I love playing horseshoes with my family and watching the fireworks at night. Fireworks by the lake with friends. My favorite July 4th tradition is to decorate R,W & B. Then get together with family and have a get potluck supper and watch fireworks! We have a family cookout and roll out the first watermelon of the season! We get the biggest one we can find and always buy one with seeds for the spitting contest! Afterwards we enjoy fireworks. July 4th is fireworks, hot dogs and remembering those who fought for our country. Thanks for the chance! A great tradition is watching fireworks with our American Legion friends across the street from the fireworks display. We all bring food items to share for hamburgers, hot dogs and all the "fixings." Picnic with family is our usual tradition. We all bring food so lots of fun. Our family tradition is a cookout and always water balloon fights and other games. At night we watch the fireworks while enjoying a few cocktails. My husband and I take our 1960 MGA and go and watch the fireworks sitting in the car with the top down and under the stars. It is so beautiful. Wonderful block. Cooking out is always a favorite tradition with us. Gotta have potato salad too. My favorite 4th of July tradition is getting together with my siblings and their families at my brother's place and having a cookout and fireworks, swimming and pontooning. What a great block and tutorial! I love the fireworks in our town on the 4th! We used to go to the lake and watch fireworks. The reflection was so pretty!